The Folk Dance Federation’s annual festival of folk dance with workshops, dinner, dance party, and special attractions! This year’s theme: Octoberfest! 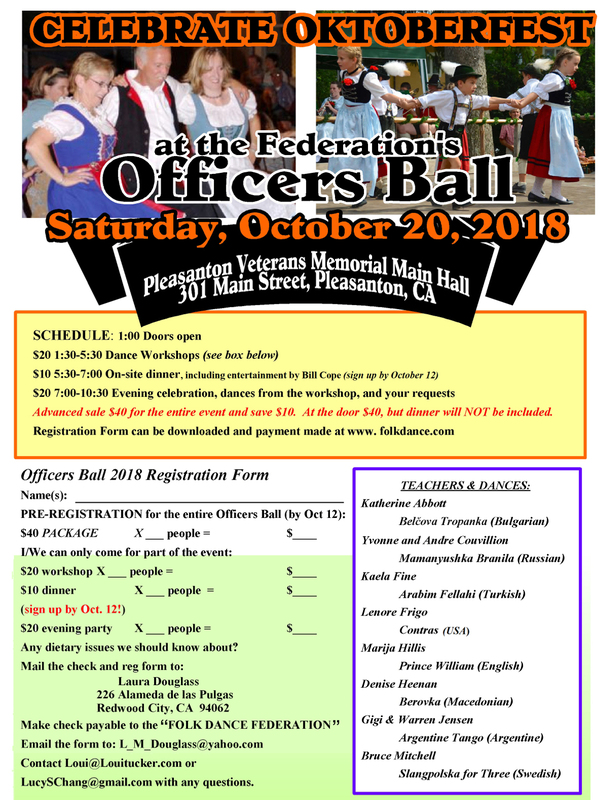 Please note the location this year is the Pleasanton Veterans Memorial Hall, Pleasanton. $20 7:00-10:30 Evening celebration, dances from the workshop and your requests. The afternoon workshop will again feature new and classic folk dances taught by local teachers including Katherine Abbott, Marija Hillis, Kaela Fine, Denise Heenan, Gigi and Warren Jensen, Yvonne and Andre Couvillion, Bruce Mitchell, and Lenore Frigo. Register by Friday October 12, 2018 to obtain the special all event package pricing (workshop, on-site dinner, and evening party) of $40 and save $10. On-site dinner registration is not available after October 12. Register and pay online at http://officersball.bpt.me. Badges will be available by will-call. Make checks payable to the FOLK DANCE FEDERATION. Contact Loui Tucker or Lucy Chang for answers.